Time does fly when you’re having fun, but before you realize, the mirror is showing you brown spots, fine lines and wrinkles that you are sure were not there yesterday. 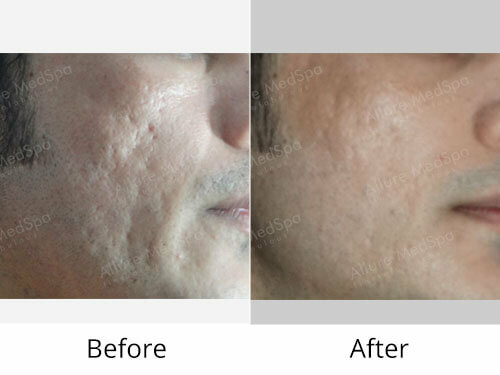 Allremedspa’s Fractional Laser is ideal for treating all visible signs of ageing, including brown spots, sun spots, fine lines, wrinkles, irregular skin texture, acne scars or stretch marks. It uses pinpoint laser beams to precisely target problem areas, so it’s perfectly suited to facial skin. Initially, your practitioner will apply numbing cream to the treatment areas to ensure your comfort Fractional Laser involves a handheld laser device that emits microscopic columns of laser at a precise deep level underneath the skin’s surface. It is ideal for treating a fraction of area each time leaving the rest of the tissue untouched. As soon as the laser beam touches your skin your body’s natural healing process will be kick-started resulting in the production of new collagen. 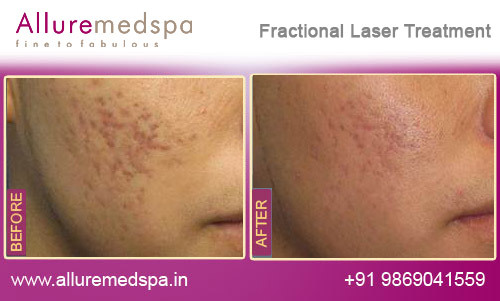 Our Fractional Laser treatment is incredibly safe and effective and, as it is non-surgical, downtime is minimal. The points of light shine directly into the lower layers of your skin and target damaged and old skin cells. The heat and light stimulate your body’s natural healing process, encouraging new, youthful cell growth. 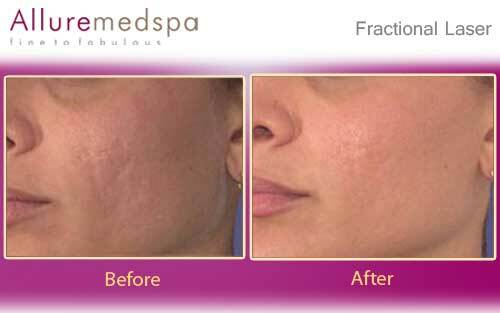 Fractional Laser penetrates deep into the skin’s layers utilizing precise points of light to treat thousands of microscopic areas of the skin and get rid of damaged and old skin cells. After the first treatment new cell growth is stimulated leaving you with a healthy, youthful skin. 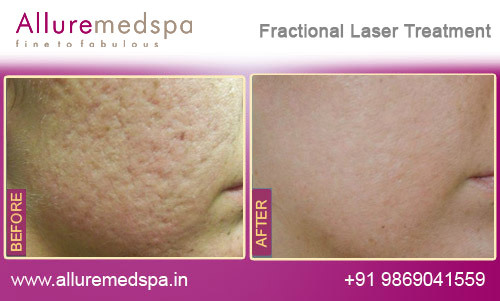 In Fractional Laser, we offer a personalized treatment plan that is tailored to the individual. To preserve the uniqueness of every client aesthetically, we offer each patient a customized plan to cater to his/her unique face and issues. After the treatment you should expect redness, sensitivity and a sunburn sensation. Your skin will start to peel off, shedding all the dead cells and replacing them with brand new ones. 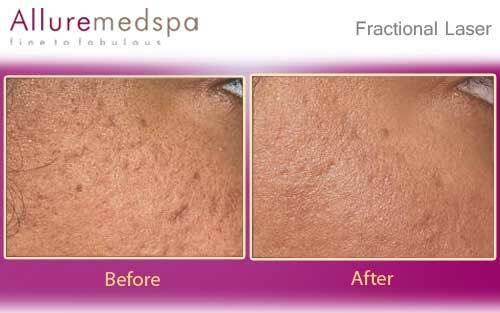 This resurfacing treatment will leave you with a fresh, completely rejuvenated skin. Your practitioner will advise you on the homecare and type of products you should use after the treatment. Your dermatologist will outline a cleansing, moisturizing, and sun-protection routine to use at home and advise patients about the use of makeup and other skin care products after the procedure. You will notice some improvement immediately although optimal results might take time. You’ll notice some results immediately, but your skin will continue to improve over the following 3-6 months. Allure MedSpa which is renowned for its state-of-the-art internationally acclaimed services, offers affordable and cost effective weight-loss and cosmetic contouring procedures. To know more about the cost of your procedure request a consult by filling the form below.Your consultation is your chance to ask questions about Face Rejuvenation treatments and put your mind at rest. Our surgeons and cosmetologists will be there to offer full explanations and answers to all of your queries. Prior to the treatment a patch test might be done. This test will not only ensure there are no side effects but is also a chance to get an idea of the treatment. Your dermatologist will be the one to decide whether you are the right candidate for Fractional Laser depending on the results of the test. A patch test might be done to see if there are any side effects. 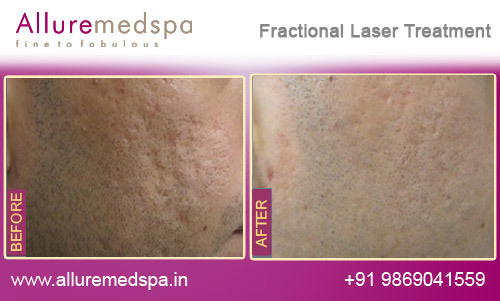 Fractional Laser is a resurfacing treatment that involves minimal downtime that can get slightly uncomfortable depending on the intensity of the treatment. Your highly experienced practitioner however will apply a topical anesthetic cream prior to the treatment to ensure you are feeling comfortable at all times. 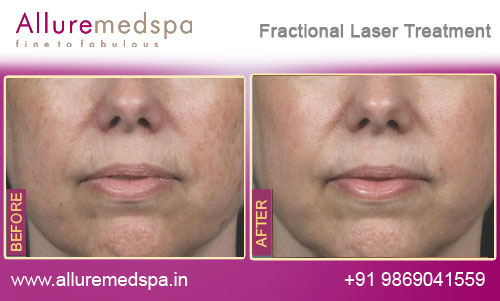 How do Fractional Lasers Work and is Performed? Though you always find an individual who has a lower threshold for pain, most of my patients find laser treatment very tolerable. In their opinion, it’s not painful at all. Therefore, the procedure is usually performed with local anesthetic creams or even without anesthesia. The treatment session takes about 45 to 90 minutes with 3 to 7 days interval between sessions. By targeting water as its chromophore, the laser induces a dense array of microscopic, columnar thermal zones of tissue injury that do not perforate or impair the function of the outer layer of the skin (epidermis). 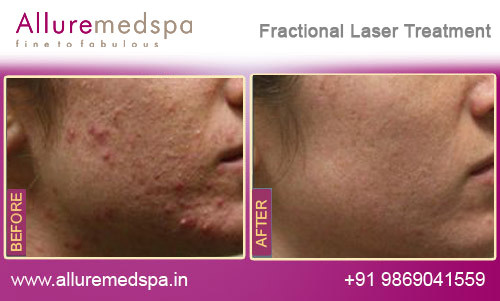 The treated skin area rapidly recovers with newer skin and healthy tissue (Non-Ablative Therapy). The fractionated carbon dioxide laser beam is broken into numerous microscopically thin beams that strike the skin and vaporize sun damaged or scarred tissue. This causes the skin to tighten, and during healing, produce collagen – the protein responsible for skin structure and appearance (Ablative Therapy). 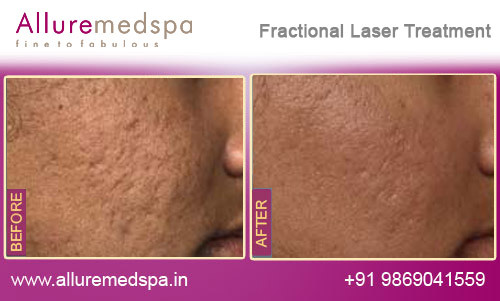 When therapy is done in fractions, this allows the skin to rapidly recover with little downtime. Further the side effects with this type of therapy are less and complications are very rare. In most cases, the old damaged skin is replaced by the new skin within a few days. What is the recovery time and the final results? Recovery from laser treatment is generally not lengthy and usually involves some redness and swelling for several days.Because fractional laser therapy only treats part of the skin, additional therapy is required to treat the entire skin surface. Most individuals require anywhere from 4 – 6 sessions to treat the damaged skin. The results of fractional laser skin resurfacing are not immediate but evidence of a smoother and tighter skin will be evident after 2 – 3 sessions. Patients experience an immediate improvement during treatment associated with the laser heating their skin. The collagen contracts making the skin appear immediately tighter. However, the final results related to collagen production which takes several weeks to months to be remodeled (8-12 weeks). Patients will continue to see improvements in their skin for the first three to four months following treatment. However, the results are not permanent. What are the risks of Fractional Laser Procedures? Rarely, infection and scarring or discolorations of the skin are certainly theoretical possibilities. However, the strict following the medical instructions will help you to avoid these complications. There are treatments available, particularly with lasers, which can help improve stretch marks, however, no treatment can yet make a stretch mark go all the way back to looking like totally normal skin. Laser and other modalities improve the problem but don’t remove it. There are no ‘perfect’ treatments for stretch marks. A series of treatment sessions are usually needed to obtain the best results. With expansion of the skin, by pregnancy or morbid obesity… etc., the elastic fibers of the deeper layer of the skin (Dermis) are broken, leaving a Red Stretch Marks or Linea Rubra. After healing of this cracks by fibrosis, they become a whitish in color in what is called White Stretch Marks or Linea Alba. How to prevent these marks? One thing you can do during pregnancy or times of weight gain is to apply topical creams like alpha-hydroxy acids or Retin-A medicines. These topical medicines can be helpful in curbing the onset of stretch marks in the first place. 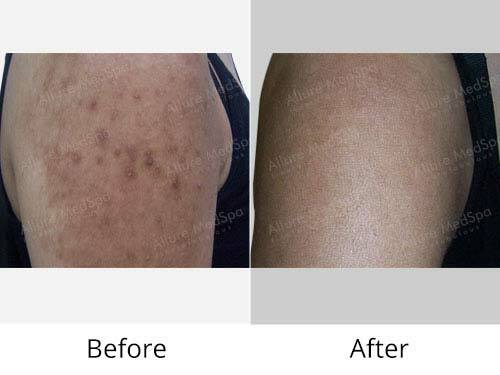 As these marks look a lot like early scar tissues, lasers can be highly effective at reducing the redness and stopping some of the inflammation. Lasers also induce collagen growth and remodeling, as well as some elastin remodeling which improves the look of the skin. The pulsed-dye laser is the treatment of choice for this. 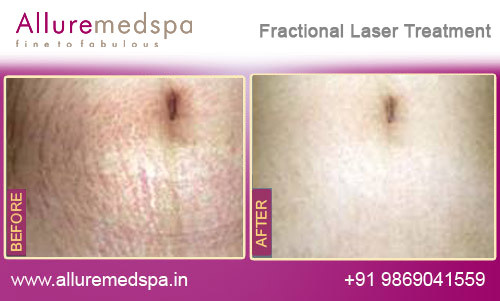 The latest development in the treatment of stretch marks is fractional laser therapy. There are some risks that some patients may not be responsive to the therapy, as well as some risk of post-inflammatory hyperpigmentation in darker individuals that takes some time to fade away.